Dublin, Ohio — The Memorial Tournament presented by Nationwide hosted the fifth annual Legends Luncheon presented by Nationwide today, a unique, award-winning fundraiser that brings to life the alliance between the Nicklaus Children’s Health Care Foundation and Nationwide Children’s Hospital. All proceeds of the Legends Luncheon directly benefit the young patients and families that Nationwide Children’s Hospital compassionately serves each day. True to the hearts of Jack and Barbara Nicklaus, the Memorial Tournament presented by Nationwide includes as one of its primary objectives a genuine, philanthropic vision, and it is through the Tournament’s partnership with Nationwide Children’s Hospital that this vision comes to life in the form of pediatric care for children in need throughout central Ohio. 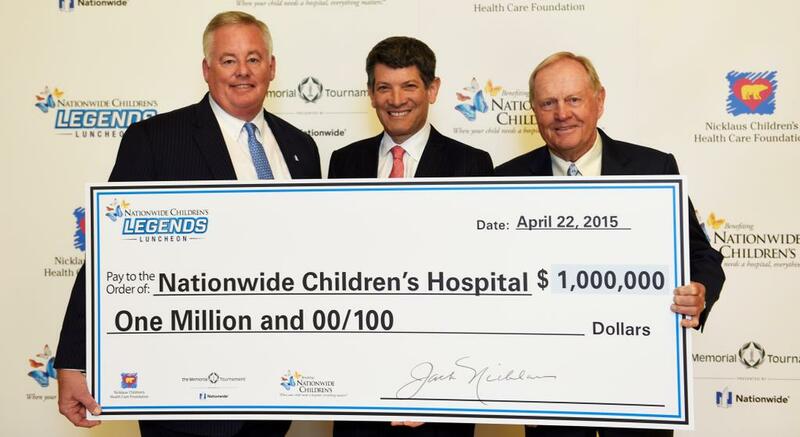 Fifth-year Tournament sponsor Nationwide shares a similar tradition of support for Nationwide Children’s. Nationwide is committed to broadening the impact of its presenting sponsorship of the Memorial Tournament to bring greater awareness and increased funding to Nationwide Children’s and to those who benefit the most – families and children in need of care. Hosts of Legends Luncheon presented by Nationwide were Jack and Barbara Nicklaus, together with Nationwide CEO Steve Rasmussen and his wife, Cindy, and Nationwide Children’s Hospital CEO, Dr. Steve Allen and his wife, Dr. Jamie Allen. Luncheon guests experienced a charity event that is unique to Columbus, Ohio. Held at the Ohio Union on the campus of The Ohio State University, guests enjoyed a special conversation with Memorial Tournament Host and Founder Jack Nicklaus and 2015 Memorial Tournament honoree and World Golf Hall of Fame member Sir Nick Faldo. NBC and Golf Channel Host and 13-time Emmy Award winner Jimmy Roberts moderated this special discussion. The final highlight of Legends Luncheon presented by Nationwide was the presentation of the “Nicklaus Youth Spirit Award,” which is given annually to a patient or family who in some way has demonstrated a strong, driving spirit in overcoming obstacles, an unwavering optimistic outlook, and a strong conviction for their connection to Nationwide Children’s Hospital. The Nicklaus Youth Spirit Award honors the courage within that inspires volunteerism and community outreach, which has a positive influence on others. This year Jack and Barbara Nicklaus presented the Nicklaus Youth Spirit Award to Nationwide Children’s Hospital patient, Juan Crestanello, 18, from New Albany, Ohio. Being a teenager comes with its own set of difficulties, but when Juan was 16, he encountered an additional and unbelievable challenge. He was diagnosed with Burkitt’s lymphoma — a fast-growing cancer usually characterized by a large abdominal tumor and may have bone marrow and central nervous system involvement. Juan underwent 5 cycles of intensive in-patient chemotherapy. It didn’t work. In August 2013, Juan completed his treatment. He is in remission, but continues to be monitored closely for a potential relapse. He is back to participating in the things he loves: school and sports. He is maintaining a 4.0 GPA, and running and playing tennis. Juan’s tenacious conviction for his connection to Nationwide Children’s Hospital has never wavered. “I can proudly say that Nationwide Children’s not only saved my life, but my experiences there transformed me into a better brother, a better friend, and a better person.” More than these things, Juan is an inspiration. Last year, this exceptional teenager took the stage to make a schoolwide presentation about his journey. As a Nationwide Children’s Hospital Patient Champion, Juan has volunteered to take part in events, sharing his story and the story of Nationwide Children’s Hospital, to help kids everywhere reach their fullest potential and, rather than be “normal,” be extraordinary.